If you have a music obsessed kid in the family, then this gift is bound to keep their attention for a while. It’ll allow them to make their own music in a similar fashion that an actual music producer would. It also gives them a way to share the music that they’ve made with the rest of the world. The toy is meant for not just kids, but teens as well. 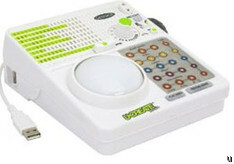 The digital music-making system is created to be easy to use for kids. Of course not for kids under the age of 8. However, those above that age will be able to create their own music and then share it on the website myucreate.com. The website also has a huge online library so they can build from a collection of tracks, special effects and filters. Encouragingly enough, the device has received great reviews from parents that purchased the toy for their kids. You can purchase the Ucreate Music toy for about $31.